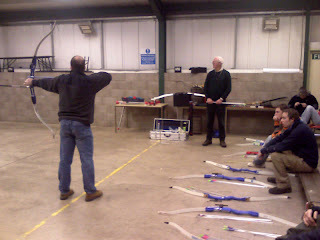 Above : Course tutor Derek passing on top shooting tips to the class. Although it's been a fairly quiet month in terms of campers and visitors, the centre has been hosting a few training courses which have been well-attended. A weekend emergency first-aid course run by staff member Brian last weekend was sandwiched between a 2-part GNAS Archery Leader course which has been a regular feature over the past few years. 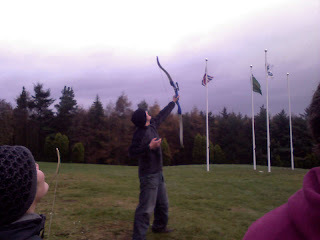 The archery course is run over 4 days, the first 3 being training and the final one being an assessment. Local archery guru Derek was the main tutor as before, with regional coach Frank coming all the way down from Aberdeen on the sunday for the umpteenth time to assess the candidates. 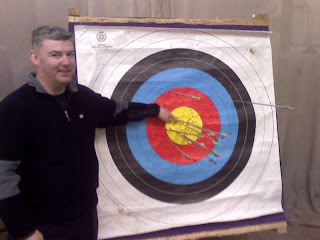 12 people attended the course in total - a mixture of staff from Fordell and Auchengillan activity centres, regular site users Fairbridge (Edinburgh), one local leader and local guy Steve who is planning on starting up an archery club at his childrens' primary school soon. Above : No James, I think you'll find that your arrows are the ones which are lying on the ground next to the target. In a pretty intensive few days, Derek covered a huge range of sessions including shooting technique, coaching, equipment selection and maintenance and safety. In between the two weekends the course members had the chance to improve their technique before the assessment and also brush up on the theory side of things. Above : Shortsighted Tristan from Auchengillan aims for the yellow, which turns out to be the sun. Surprisingly, he hits it first time but receives minor burns whilst retrieving it. By the assessment weekend all the participants had managed to improve their own techniques considerably, now regularly hitting the target gold instead of the rest of the target / safety net / wet weather hall roof girders (delete as applicable). 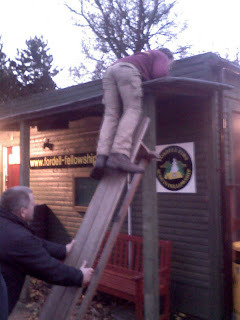 Above : Bob catches Auchengillan staff member red-handed, trying to steal the roof off the staff-hut. On the sunday, assessor Frank spent several hours testing everyone's knowledge and practical ability, and remarked that the group had been one of the best he'd seen in recent times. All participants received their Archery Leader award and will now be entitled to instruct sessions on their own using the skills picked up during the course.